Jasleen Kaur is a Scottish Indian artist based in London. Brought up in a traditional Indian household in Glasgow, she is fascinated by the malleability of culture. Her work examines the continual adaptations and subtle changes in people’s behaviours and traditions, exploring how social histories become embedded in materials and objects. The idiosyncratic habits of family members inspire her work; refashioned objects are based on instinct and resourcefulness, reflecting a hybridity of national custom and reconsidering the realities of materiality, usage and everyday routine. Jasleen is a visiting lecturer at The Royal College of Art and devises workshops and programmes for the Victoria & Albert Museum, National Portrait Gallery, Crafts Council and Sorrell Foundation. She exhibits worldwide with recent commissions including Baltic 39 Figure Three and Art on the Underground. She was awarded the Jerwood Makers Open 2015 and her work is part of the permanent collection of the Royal College of Art and Crafts Council. 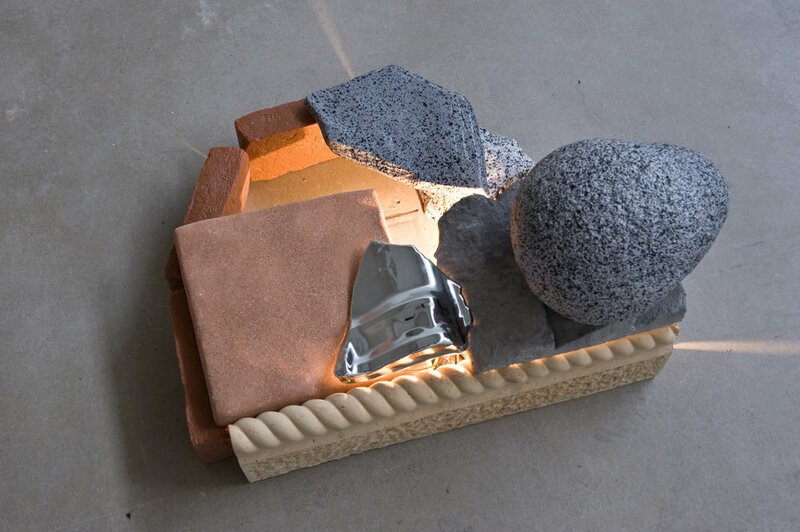 ‘Cairns’ is a series of three touch lamps influenced by the act of my parents who for 30 days ritualistically prepared a joth (ghee candle) and placed it on a derelict plot of land by their house within a shelter of bricks and tiles, adhocly put together from rubble found on the site. They were advised by a saint to light the joth at sundown for thirty days to ward off negative energies. This project is explicitly personal, and explores the disparity between Indian and Western rationale through an object that expresses a confluence between two cultural ideas, values and aesthetics. You are welcome to turn the Cairns on and off by gently touching the chrome components.